All aboard! This May RMB is excited to publish When Trains Ruled the Rockies: My Life at the Banff Railway Station by Terry Gainer, a personal history of the Banff train station from 1948 through 1962. 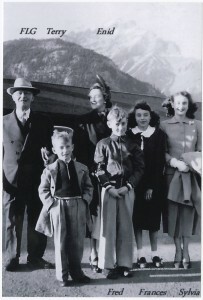 Drawn from Terry’s personal memories and experiences from his years living and working at the legendary Banff Railway Station, When Trains Ruled the Rockies is an entertaining memoir and important historical record beckons the reader into the golden age of railway travel in the mountains of western Canada. At one time it was the dominant means of transportation for Canadians but sadly an experience that is now fading into history. This excerpt from When Trains Ruled the Rockies details the filming of Hollywood western Canadian Pacific at the Banff Railway station and how it served to promote tourism in the Canadian Rockies. He just got off the train and now he is by the Brewster Kiosk!” “He” was Randolph Scott, one of America’s most famous cowboy heroes. 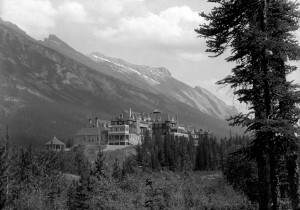 Out the door we all scrambled, only to see a deluxe Brewster limousine driving away from the station, heading for the Banff Springs Hotel. Would our world ever be the same? About the same time, CPR crews, carpenters and labourers were hard at work building something about a half-mile east of the station at the “wye,” and the area had been posted off limits to the public. The wye were two tracks forming, of course, a Y-shape, with the top end of the Y joined to the main line by a set of switches. (A much more economical solution than constructing a mechanized turntable, a wye was used for turning locomotives and cars around. The locomotive would enter one branch of the Y that was at a 90-degree angle off the main line and proceed to the top of the straight tracks. When the locomotive cleared the Y junction, the brakeman would throw the switch and the locomotive would back out the other side of the Y facing the opposite direction.) 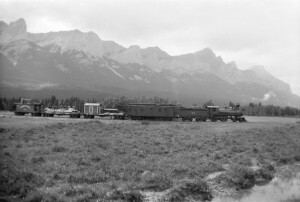 The tracks for the north end of the Banff wye extended for about 500 yards, providing plenty of space to construct the movie set, a mock-up of a railway construction village. The news flashed through the community like wildfire. This must be the movie set for the filming of Canadian Pacific, starring Randolph Scott! Mervin and I set off down the tracks to the wye to investigate. Our first attempt to visit the movie set was rebuffed by a CPR policeman who shooed us off, I guess as a safety precaution. But little did he realize he had come up against the future Station Bush Gang! After being chased off the set, Mervin and I backtracked and then set off through the bush. Crossing Whiskey Creek and tromping through the forest, we followed a branch of Forty Mile Creek that flowed past the top end of the wye. No cops or security guys were to be seen, and we spent a good part of the morning watching the crews constructing false-front buildings and fashioning a railway camp. Also onsite was a flume-stack locomotive, an old business car and a wood-sided passenger car – no doubt donated by CPR to add period authenticity to the set. Over the next few days, we’d wander back to the wye to spy on the filming, but nothing much ever seemed to happen. Instead of those breathtaking, broad action scenes we’d viewed in the theatres, the only filming we could see appeared to be short 20- or 30-second takes of our hero boarding a railcar, people talking or the construction crews laying down a rail. It was just plain boring. We 6-year-old critics had seen enough! There was far more action in the bush. During my school years, numerous Hollywood movies filmed in and around Banff, including Fort Saskatchewan with Alan Ladd and Shelly Winters, and River of No Return with Marilyn Monroe and Robert Mitchum. But none of them included trains or the station so I showed little interest.